This week, as we are just recovering from ECF Live, Bill and I recap our favorite moments from the event. If you didn’t get the chance to go, or even if you did, this episode covers some of the highlights that made the event an incredible success. We share our favorite quotes, the incredible lessons we learned and the one thing that both of us immediately applied to our businesses. 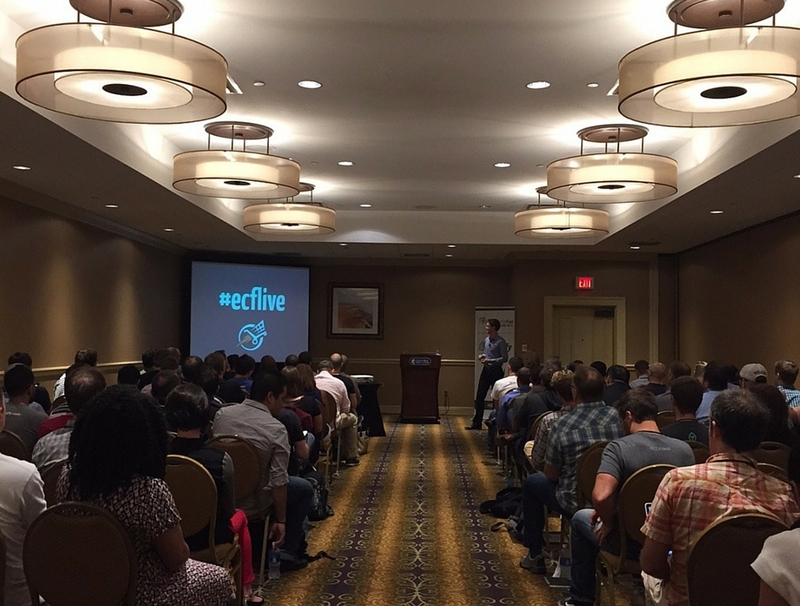 So sit back and listen up, because this episode is going to ensure that you are going to want to be one of the lucky hundred that will be at ECF Live 2016. Andrew: Hey guys, its Andrew here and welcome to the eCommerceFuel Podcast. Thanks so much for joining us on the show today. Today, joined by Mr. Bill D’Alessandro from rebelceo.com and the topic of discussion, Nashville eCommerceFuel Live 2015. Bill, man we made it. Bill: We made it. We’re going to discuss I think the extent of damage to my liver that was done at the conference. Andrew: Crazy, really fun weekend, we’re going to talk about some of the takeaways, all the things that happened, but first, I’m a little concerned, Drew Sanocki, you met Drew the first time in Opryland where we held it. A labyrinth of mazes and gardens and the last I heard, Drew was stilling trying to find his way out after two and half days and was starting to, yeah, I think scare some of the people there. Bill: Yes, he posted something on Instagram from New York City yesterday, so I think he’s alive. Andrew: He made it, yes. Bill: He made it intact. Andrew: Oh man, but it was crazy. The venue that we picked, we knew it was big, but oh my goodness, they had three atriums that these atriums were like, you could probably fit at least two or three football fields inside of at least one of them. And yeah, a fun place to do it at least once. I’m not sure if we’ll do it again, but wow, yeah it was a crazy place to hold a conference. Had you been there before? Bill: I had never been. I had been once to Nashville. I heard though, someone told me, one of the other attendees told me, it is the largest hotel in America without a casino. Bill: Which makes sense to me, it very much reminded me of Vegas style hotel. Andrew: Yeah, agreed, it had that scale to it. But yeah man, fun event, we had about a hundred people that made the trip from all over the place, all across the country and the world. And we’re going to get into the takeaways here, but more than anything, I think even more than the presentations was just cool connecting with people in the community that you’ve known forever by just their little 50 pixel by 50 pixel avatar and seeing them in person, and the vetted group of people there was fantastic to get into one place, which I think is what made it better than anything else. Bill: It was so cool. I mean, every single person I talked to said it was the best conference they had ever been to. I mean, to be in a room with 100 vetted 6 and 7 figure and 8 figure store owners. And normally you go to a conference, there’s maybe 10 people there that are worth meeting, but every single person at ECF Live was fascinating. I mean, you could just walk up to any attendee and say, “Hi, what do you do?” And hear an incredible story. Everybody was so smart. I had takeaways, we’re only going to talk about a couple of them on this podcast, but I have been…I told you before we started recording that I came back on Monday and just all my employees are probably hating me, because I dumped so much stuff on them to do and I’m doing so much. I’ve been working late nights all this week. Just so many ideas and takeaways for my business, I mean hands down, the most valuable couple of days of my year, every year. They’re doing crazy stuff that you never would have guessed. And you don’t know, it’s the old cliché adage, “You can’t judge a book by its cover.”By what somebody is saying they’re doing or proclaiming to the world that they’re doing. But man, there’s some people doing some really cool stuff that you might not have otherwise realized. Bill: Yeah right, it was so cool. I need to send him some pictures of my car when I was in high school and college with the computer built in. Andrew: You should send those to me too. I’ll get them posted up on the show notes. I’d love to see them as well. Bill: I will. I’ll send them in. Bill: Yeah, it was good, blew my mind. Andrew: Yeah, and for me there are so many different takeaways there, but the one I took away that I could act almost quickly and start seeing results was, even if you’re not doing Facebook advertising, get the Facebook tracking pixel installed on your website, and what that does is anyone who comes to your eCommerce website, so, like Right Channel Radios for example. That is logged into Facebook, it will track them, and even if you don’t pay Facebook, just having that installed will give you an incredible amount of data and insights on your audience. So you can go in and say, “Oh, what’s the demographic of my audience in terms of gender? In terms of income? In terms of interests? In terms of what kind of pages they like?” You can get data from Facebook that you’re not going to get from something like Google Analytics. And so at a minimum, do that, so you can get that data, and also in the future if you decide to, you can advertise more effectively to then. Bill: Yeah, I thought that was so cool, even if you have no intention of doing Facebook advertising, the demographic data that it will gather for you is fascinating. I mean, just to be able to know you’re your audience is typically age 45 to 55, female, and a certain income bracket. That’s hugely valuable information that you can use to inform all of your marketing and your web design and your product selection, all sorts of things, even if you don’t do any Facebook advertising at all, I didn’t realize you could get that. So, yeah, I’ve got the pixels on my sites already, within 48 hours after Miracle’s talk. Andrew: Yeah, me too, I came home, it was the first thing I did. And it’s funny, because you can get some of those high level metrics from Google Analytics, but if you think about Facebook and how much they know about you, I think the data from Facebook almost certainly is going to be way more accurate than what you’d get from Google analytics. Bill: Oh yeah, way more, way more, and deeper. Andrew: Agreed. Bill, what do you got? Maybe we can alternate takeaways here. Bill: Sure. So one really cool takeaway that I got was from talking with Dana about postcards. So when you think about marketing and eCommerce, you don’t think about old school marketing, you think about online marketing, but Dana and her store homehealthtesting.com, saying she sends out a bunch of postcards to doctors’ offices, to try to get them to buy her home health tests, blood tests, urine test, etc. And so, I was talking to her and she says it typically costs about 50 cents to send a postcard, postage and paper included, which you would pay that for a click on Google, and instead you can pay 50 cents to get in somebody’s mailbox holding their postcard in your hand. So we’re going to do, basically everybody who has ever bought from us in the past and hasn’t bought in the past 6 months, we’re going to send out about 5,000 plus postcards now to all of our old customers, and we’re also going to send out postcards to Amazon customers. So if they’ve bought on Amazon, we have their address, but we don’t have their email address. So we’re going to send a postcard out that says, “Hey, here’s a discount coupon, go to this URL and enter your email address to get 25% off.” And that’s going to help us to capture some of the real email addresses for Amazon customers, and try to do some marketing then that way, where you can’t email market to them normally when they buy from Amazon. All you can do is ship them their package or ship them a postcard. So, I think that’s going to be a big win for us. Andrew: With Amazon, again, I’m not a huge…I’m not an Amazon seller at all, so I have a lesser understanding of this, but Bill, even with Amazon, you can’t necessarily include a promotional…you couldn’t include that postcard with a link to your website in the Amazon package, could you? Is that against Amazon’s rules? Bill: It’s against their TOS. I mean, you could in theory for seller fulfilled stuff, and I also know of some people that when they send things to FBA, they put a hang-tag on the bottle or they wrap some promotional material inside bubble wrap with their product, and try to include things that way, and get around it, but for FBA, if you’re not packing the box, that promotional thing has to be physically attached to your product or it’s not getting in the box. And then Amazon really frowns on it if you do it for seller fulfilled stuff. And to be clear, disclaimer, probably sending the postcards is also against the TOS. So, the People out there listening, don’t tell anyone I told you to do that. Andrew: Another takeaway I had was from Drew Sanocki’s talk on whale hunting, more or less, is how I’d summarize it. And his whole premise was that all customers are not created equally, and we all know this, but he walked through a very systematic framework for using analytics to figure out, okay, well how can you find what channels are driving your best customers? And so, not just what channels are converting at the highest conversion rate or driving the most revenue, those are important as well, but where are your whales coming from? Your customers that order the most frequently, that order the highest dollar volume, that order the most quantity of product. And if you can find those and double or triple down on those acquisition channels, it has an exponential impact on your business that is hard to replicate. Bill: Yeah, the thing that I thought was really cool that opened my eyes from Drew’s talk, is to segment your marketing channels to figure out where your whales actually come from. And your whales might be defined differently for any business, but basically, it’s a high lifetime value customer, someone who spends more money than average. And what Drew did that was really cool is he segmented his traffic, so he said in Google analytics, he just segmented it, I think it was number of transactions more than two or three. And he said, “Which acquisition channels bring me the most whales? Is it AdWords, is it Facebook ads, is it organic? Is it referral traffic from blogger outreach or what is it? And he could see that, let’s just say for example, Facebook traffic sends you a disproportionate amount of high average AOV customers. Then, the cool takeaway for that is you can actually increase the CPA you’re willing to pay on Facebook, because you know that a Facebook customer is more valuable. So that’s a directionally actionable thing that you can do, is to deploy more budget and hire CPAs in the channels that you know are paying back and bringing you high dollar value customers, and dial down the CPAs in channels that aren’t. So, the concept of thinking of CPA by channel instead of just CPA overall, was really interesting to me. Andrew: And I think even more amazing was the deep whale voice and the high squeaky little male voice that he did, oh man. Bill: Perfect, it really cemented it in my mind I’m going to hear his whale voice every time I do this. Andrew: We’ll have to…Maybe when he comes on next episode, we’ll have him do a recreation for people on the podcast. I’m sure he’d be willing. Andrew: Bill, what’s your next one? Bill: So my next one is to build more aggressive welcome campaigns for people that sign up for email lists. I talked with Manny from Satin Lined Caps. Manny did a really cool talk on YouTube marketing, and I was, unfortunately not able to be in the talk, but I talked with him at length at dinner after the talk, and so I got the gist. And the thing that I actually took away from it is, A, to try YouTube marketing, which we haven’t tried yet either, but something that was applicable to everybody, even if you’re not doing YouTube marketing, this concept of how to aggressively gather emails, and then sell to them after you get an email. So, what Manny does is when he has an influencer do a YouTube campaign, there’s a link in there to satinlinedcaps.com/the YouTuber’s name. And it says ,”Click here, get 25% off a satin lined cap.” And you click on that link and all it is an email form and it just says, “Enter your email address to get your coupon.” And then you enter email address, it immediately sends you the coupon for 25% off. And then Manny has a drip campaign. So 24 hours later, you get a long sales copy email about why their product is awesome. Twenty-four hours after that you get another content email sales copy about why their product is awesome and to use it. And then 24 hours after that on the 4th day, you get an escalated coupon. So, if you still haven’t bought, instead of 25%, you get a better coupon for 30%. And I realized that this flow can be applied to almost anything, any lead gen that you’re doing. If you’re doing giveaways on blogs, if you’re doing Instagram marketing, or you’re doing…even if you’re driving traffic on Facebook, taking what Miracle taught us about Facebook, and one of my takeaways from Miracle’s talk on Facebook was that people on Facebook are impulsive. They want to just be able to click a button. So the idea of trying to use Facebook advertising to harvest email addresses instead of get the transaction right there on Facebook, and then hit the email addresses you get with this aggressive sales autoresponder through email with a coupon, that Manny described from his YouTube marketing, I thought the hybrid of that was a big takeaway. So we’re redoing all of our autoresponders when you get on our lists. There’s some much more aggressive, hard-hitting, with an escalating coupon. And now we’re also…it’s caused me to rethink all of my marketing. Manny was saying he’s closing a very high percentage of those leads into sales. So that allows you to refocus your marketing into, “Maybe I don’t need to get the sale directly from the click, maybe I just need to get the email address.” So that’s led us to think about a lot more ways we can do that and focus our marketing on lead gen and then close via email, rather than trying to close directly from the ad. Andrew: Yeah, it’ll be interesting to see how things transition over into advertising and selling on Facebook. It’s nothing new of course, but I think in our community, man, people are really amped up, at least attendees from the event after hearing Miracle’s talk. And Paul Lepa was following up, he’s diving in as well, and asked an interesting question where he said, “It sounds like some people are saying that on Facebook, Facebook’s really, really effective for a product, where the absolute value is hard to gauge.” Take for example your proprietary skincare products Bill, that’s hard to know since you own the monopoly on that. Well, maybe, but usually it’s more of a need based thing, they think about it and they search. So it’ll be interesting to see how that plays out as people start sharing their data in the community, about what types of products perform really well, and which ones maybe don’t get as much traction. Bill: Well, I think something like a CB radio might be better for remarketing on Facebook. Bill: You can tell that they’ve been browsing around, and then maybe you close the sale. But yeah, I agree, definitely not a cold impression, probably not going to buy a CB radio. Andrew: I’m going to start retargeting you all over the place, CB radio retail. Bill: Go to some of my websites, I’m sure you’ll be seeing my ads. Andrew: Oh man, you’re spending like $20 a month retargeting me, but you don’t even know it. Bill: Possibly. Another thing that I thought was cool about Facebook ads is, that Facebook is rolling out all of these different new ad types. So, I think there is just a lead gen ad type, where it’s just, “Press a button to give us your email address,” because Facebook knows your email address all ready, so they actually don’t have to type in on a form. It just says like, “Enter the giveaway, boom, press the button,” and you get their email address. So that’s something we’re going to be experimenting with too. Andrew: Yeah, very cool. One of my favorite quotes from the event was from David Heacock. David was another one of our keynote speakers. An ex-Wall Street finance guy like us as well Bill. He left and has built a really impressive business in just three years, and his quote was, “Your complexity is my opportunity.” It was a little bit of play off of Jeff Bezos’ infamous, “Your margin is my opportunity.” And his whole point was, he does things that other people aren’t willing to do. If you can be completely vertically integrated, which means, if you can be the guy who manufactures it, who imports it, who sells it, who does everything, if you’re willing to absorb that complexity, you get more margin, and you’re able to compete more, because you’ve got more room to market, you could spend more to acquire a customer. And from a broad sense, I really related to that at a much smaller level with CB radios. That’s the only reason we’re able to make money there, selling existing products, is because is a complex niche. So, I thought there were a lot of cool takeaways from that quote from his talk. Bill: I like that too, and that’s the drum I’ve been pounding too, like, the easier the business, all these people are out there saying, “Oh yeah, just start basic drop shipping or source some stuff from China and throw it up on Amazon.” The more basic the business, the lower your barrier to competition. So just like it was easy for you to dive into a business, it’s going to be easy for somebody to come in and dive in and compete with you also. So the more complexity you can take on and be successful with, the higher the moat around your business, which I think should be a takeaway for a lot of people. Andrew: Yeah, and I think a theme of the conference, it’s been a theme I think for the last year or maybe even two in eCommerce, but especially it was driven home at the event was…And I talked about this in my opening remarks was just, if you’re not building your own product, you need to start now, or you’re going to be hosed in the next five years. And I think people know that, but I think also, in chatting to Laurence Camera’s breakout session on manufacturing which was really good, and it’s not easy to do. Building your own product is not something you whip out in four weeks. I mean, I think most of the time, from people I’ve talked to and I’m in the middle of it right now, it takes from six to nine months on average to bring a product to market from when you start the initial design, to go through the iterations and then when you get it, you probably have quality control problems. So it’s essential, but it’s by no means something that you can whip out in a couple of weekends. Bill: Yep, I agree, you’ve got to start now, but the perseverance to do that for nine months is something a lot of people aren’t willing to do. A lot of the get rich quick people aren’t willing to do. So, that’s a moat right there, being willing to do the hard work as an entrepreneur, if it were easy, everybody would do it. Andrew: Yeah. Bill, what’s your next one? I’ve been talking too much, sorry. Bill:: Well, my favorite quote in your theme of favorite quotes was from Paul Lepa, and he says, “You can only coast downhill.” Which just punched me in the gut when he said it, because it’s so true, because I think, at least me personally, I think probably all of us as eCommerce entrepreneurs, have been guilty of coasting a little bit. The four hour workweek lifestyle, you can travel around the world, and run your business from a laptop. It’s very easy to coast in an eCommerce business, and Paul highlighting you can only coast downhill, really drove home for me that, yeah, you can coast for a little while, but every day that you coast, you are not growing, and if you do that over a long period of time, it compounds into actual decline for your business. Last year I spent a fair bit of time coasting and traveling, and it did have a small impact on my business, and I was able to start paying attention again and right the ship. Hearing Paul say that, really got me motivated to continue to not coast and to take the business to the next level every day. So I feel like I should have it tattooed on my arm or something, “You can only coast downhill,” I really enjoyed that. Andrew: Another one from Paul I really liked was his concept, he was another one of our keynote speakers, Paul Lepa, from Pearlsonly.com, and he went through the different lifestyle phases of a business. What happens when you’re in the growth phase, then once you start to level off and you reach market saturation. And he spoke to the fact that sometimes in a business, especially in the very niche businesses we as eCommerce entrepreneurs tend to be in, sometimes you get to a point where you can’t meaningfully grow the business larger. You can keep pouring time and money in, but you get such diminishing returns that you can’t, and he spoke to a point where he just was, come hell or high water, he wanted to continue to grow his business and there wasn’t the capacity, there wasn’t the room there, and he ended up wasting a lot of time as a result. And so his conclusion was at some points with some businesses, you either need to go into a sales mode, you need to sell it or you need to just harvest it, where you just have it setup to run efficiently, leanly, and you just harvest money from it for a number of years. And so I thought that was interesting, because I think as entrepreneurs we are always just intent on, taking it to the next level, taking it to the next level, and I think being able to realize on occasion that, “Hey, I’ve maxed out this particular area, it’s time to move on,” is something that sometimes can be hard for us to do. Bill: Yeah, I thought that was really interesting and it was funny to see, look around the room and see people realizing what different phase they were all in, and nodding their head at different times in the presentation. Andrew: Yeah. Bill you had a couple of takeaways from Rob’s presentation, from Mp3car? Bill: Yeah, my biggest takeaway from Rob’s presentation was to start looking at international Amazon again, because I’ve been totally ignoring international Amazon. But from seeing what Rob’s doing around the world on international Amazon and also seeing what Paul is doing, I think there’s a ton of opportunity there if you’re willing to jump through a couple legal and complexity hoops, as David was saying, “If you can handle a little bit of complexity, there’s a lot of opportunity.” To see how much of Rob’s business was international, was really inspiring for me, to go after some of that. And I also like something from Rob’s talk where he said to look for all the inefficiencies and try to automate them. So anytime, and this is something I’ve tried to do from the very beginning in my business as well, but it’s always cool to see how other people do it. Anytime a human being touches an order, to try to find a way to automate that out, so you can get bigger and bigger with fewer people. So, that’s always been a big takeaway for me and it was cool to hear Rob say that also, again. Andrew: One that I took, another one from David, I was chatting with him at the speaker’s dinner, and like I mentioned, he’s seven, eight years out of Wall Street. I think he managed Goldman Sachs’ trading desk or option trading desk at least. And we were talking about passive income, and we live in a world where near zero interest rates, and how do you make money? And here’s a guy that knows the financial markets probably better than anyone I know, and his perspective was, your best bet for passive income is to go to a real estate market like Atlanta or a place where the cost to purchase a house relative to rent is fairly low. Buy a bunch of real estate property and have someone manage them and make, if you’re lucky, 10% per year on your money. And to me that was telling, because I think it cemented in my mind that man, if you’re looking for an easy, passive, safe source of income, really doesn’t exist in the market we’re in. And so if you’re looking to invest, that’s your best option from a guy who knows the financial markets, versus pouring your money back into your business, which Bill, if you or I ran the numbers on it, I guarantee you even if we accounted for paying ourselves, we’d see a much higher than a 10% return on our money. Just cemented in my mind that yeah, there aren’t really any super safe risk-adjusted returns to be had out in the market, and putting your money in your business as long as you’re not making crazy decisions and you’re doing it somewhat intelligently, is almost certainly gonna be your best bet. Andrew: Yeah, that’s true. Maybe in five years, we’ll have the unicorn of passive income that kicks off 20% per year and risk-free returns pop out, but I doubt it. Bill: But then you’re coasting downhill. Bill: It doesn’t necessarily work. Andrew: You are. Bill, any final takeaways before I move into maybe a couple of things that at least I thought we could maybe tweak or change for next year’s event? Bill: Oh, I want to say that’s it for me, but that’s a lot. I have a whole notebook full of notes, and man, I’ve been, so much to do for now, after the conference. Andrew: So thinking through things to change next year. One thing I think we might do is try to do more actionable workshops. Again, like I mentioned, people were really…they really would’ve loved to have, as I would’ve as well, Miracle sitting in a room with laptops and we all hammer some stuff out for four or five years and really digging at some campaigns, either on the Facebook side, the analytics side, maybe the TPC side. Some actionable workshops for people I think would be really interesting. Bill: Yeah, I think that would be really fun. Bring your laptop, open it up, we’re going to show you how to do something quick to impact you’re business. An hour workshop and you’re going to reap benefits from it forever. Set up an autoresponder, set up the Facebook pixel or something like that would be really cool. Andrew: Yeah, agreed. And secondly was, we tried to do it this year with a lot of…a decent amount of downtime and a lot of social events, but we just sent out the post event survey a couple days ago or yesterday even, and still going through the replies, but by far and away the biggest value to people was just meeting with other experienced vetted eCommerce entrepreneurs. And so next year, being able to even facilitate that, even better facilitate that with more time organizing people by group, whether it’s by a channel, either drop shipping or Amazon or by industry, maybe fashion or electronics, bringing people together and really just facilitating more of those small topic focus discussions, because more than anything that’s the best value I think people get out of that. Bill: Yeah, I think that’d be really cool, maybe you have two or three different happy hours and just say, “You have expertise in this, go to this one. Or if you have expertise in this, go to this one.” And it’ll facilitate experts talking to each other. That’d be neat. Andrew: Yeah. And then finally the size. Bill I’d be interested to hear your take on this. People, by and far away wanted to keep it small, they said the intimacy was one of their favorite aspects of it, because by the time the weekend was over, you knew, if not everyone, darn near close to everyone at the event. We had a hundred people. What do you think Bill? What’s too big for an event like this? Bill: I thought this year was pretty good. I mean, we had what, 105 attendees-ish, something like that? Andrew: Right at a hundred actually. Bill: Right at a hundred, and I thought that was perfect. I did not quite get to see everybody, and I felt, sometimes I felt a little bit guilty, because the people I knew better, I didn’t spend as much time with, trying to meet new people, making sure I got around to see everybody. And I still didn’t quite get around to everybody, which was a bummer, but I think if you can…at a hundred people, you’re probably not going to get a chance to meet absolutely everybody in two or three days. So I think for the length of the conference, two days, a hundred people was probably good, considering that it’s such a high quality group that you really do want to meet everybody. I think if you were to go another day, there might be an opportunity to meet more people. So maybe then it could creep up to 125, but I think that range is pretty good. Andrew: Man, we may have to just rent out a cruise ship next year and go on a four or five day cruise and just take over the whole boat. Bill: That would be effing awesome. The eCommerce cruise, that’s your best idea yet. Andrew: Stay posted, we’ll see how it goes. Quickly before wrapping up, I want to make sure, we had some sponsors this year that helped make it possible and helped make especially some of the social events possible. Shopify was our gold sponsor this year. Of course, if you’re a fan of the podcast, you know I love and use them, shopify.com for all you’re hosted cart needs. Quietlightbrokerage.com, probably the premier leader, no, they definitely are in terms of selling online properties, eCommerce, SAS apps, in the high six and seven figures. Mark was the founder over there, Joe also joined us. So, if you’re looking to buy or sell, check them out quietlight.com. Taxify.co, a company that helps streamline your sales tax, so if you’re…Filing sales tax is a pain, even if you’re in one state, but if you’ve got Amazon inventory and FBA or if you operate multiple states, it can become a huge headache, and they automate all of the sales tax tracking and filing and all that stuff. So check them out at taxify.co. And then finally, Shipwire.com, who Bill, I know you know the guys over there really well. Their specialty is international fulfillment. So they’ve got warehouses all over the world in five or six different continents, and makes it a ton easier if you want to start fulfilling internationally, to send a bunch of inventory there, and then you can send orders out from within the country when it’s ordered, to make fulfillment a ton easier, so check them out at shipwire.com. So again, just thanks to all our sponsors this year for making it possible. It wouldn’t have been possible without them. Bill: Yep, it was a good set of sponsors, I thought really relevant too. Andrew: Yeah, great guys, it was cool meeting them too. We had a rep or two from each sponsor there, and having a chance to just meet them in person and talk shop was a lot of fun. Bill: Yeah, and great goodie bags, I feel like you didn’t give the goodie bags enough of a shout-out. Andrew hooked up all the attendees with a really neat schwag bag of stuff from all the sponsors, a couple of different products from some cool small eCommerce companies. So, the best schwag bag I’ve gotten at a conference, for sure. Andrew: Cool, thanks man, thanks. It was good, the sponsors had some great ones as well, I know Quiet Life, they had the screaming monkey, Shopify had a little bag, the tracker that you could put on your keys or your bag and track with a smartphone. So there was some fun stuff in there from those guys. Bill: Yeah, it was great. Andrew: Yeah. Well, if you’re in the community, you want to see the wrap-up thread, or if you’re not, and you’re gonna join and you want to see what everyone thought about the event and read more into their takeaways, we will link up to the wrap-up thread inside eCommerceFuel in the show notes. And Bill, thanks so much for leading, we didn’t even talk about this, you lead a break out session on buying and selling businesses with Dana and Nate and Michael Jackness, and yeah, I mean maybe open up another can of worms here, but it sounded like that went really well. Bill: Yeah, it went really well, we had a panel on buying and selling businesses. So we brought up, in addition to myself, three other people from the forum, who had bought and sold businesses, Dana and Michael and Nate, and all had a Q&A. I did a short presentation at the beginning, and we had Q&A of what it’s actually like to buy and sell a business from the trenches, and it was really fun. I mean, it was one of many great breakout sessions, but it was really fun to hear from the other people who had done it, instead of just talking myself, is again, the value of the community. You can be in a room and five people stand up with direct relevant awesome experience for the question you’re asking. Andrew: Yeah, I was bummed I missed that one. If it hadn’t been at the same time as the Amazon one, where man, I’ve got to get my teeth cut here on building proprietary products, I would’ve been there. Bill: Yeah, well that’s why you recorded them, right? Andrew: It is, it is, although, wow, yeah we’ll see how the recordings came out. There was some logistics that made it potentially like they’ll be…but that’s a whole other conversation. But to everyone who came out, thank you so much for coming to Nashville, it was fantastic to see you. Now if you didn’t make it, join us next year. We’ll keep it at 100, keep it intimate, and looking forward to doing it next year as well. Bill, the pleasure’s always man, thanks sir. Bill: Yeah, thank you for putting on an awesome event. I had a ton of fun. Andrew: That’s going to do it for this week. 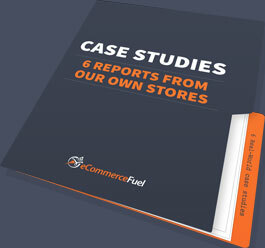 If you enjoyed the episode, make sure to check out the eCommerceFuel private forum, a vetted community exclusively for six and seven figure store owners. With over 600 experienced members and thousands of monthly comments, it’s the best place online to connect with and learn from other successful store owners, to help you grow your business. To learn more and apply, visit ecommercefuel.com/forum.